Donald Trump will probably never have a chance to build that wall between the U.S. and Mexico. But he won’t need to, because he has already built plenty of them. These walls now snake through our neighborhoods, pubs, offices, coffee shops, and family dinner tables. These walls have reshuffled the political imagination of millions of ordinary Americans who accommodate his rhetoric of hate by dismissing it as showmanship, as a campaign strategy of the primary season, or as a genuine reflection of the working class disillusionment. The spit, the flurry of fists, the sucker punches, the torn posters, the obscenities, and the helmeted police cordons at his rallies have all offered us a brief glance into the collective mind of our nation forever changed by Trumpism. Hate has been mainstreamed. 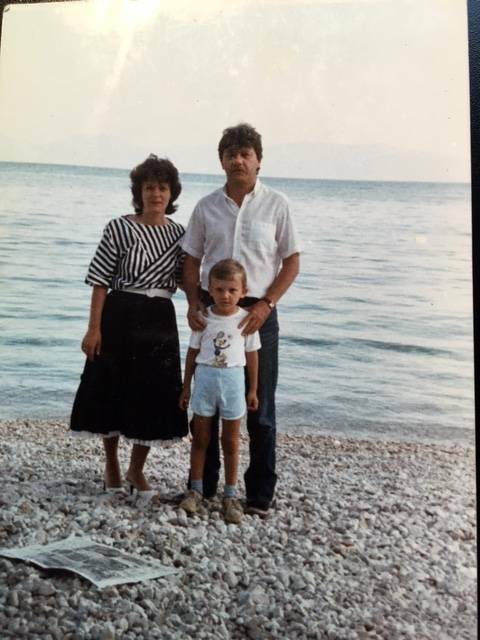 The first photograph is one of me with my parents in the mid 1980s during one of our yearly summer vacations to the Adriatic coast while we still had our country, Yugoslavia. 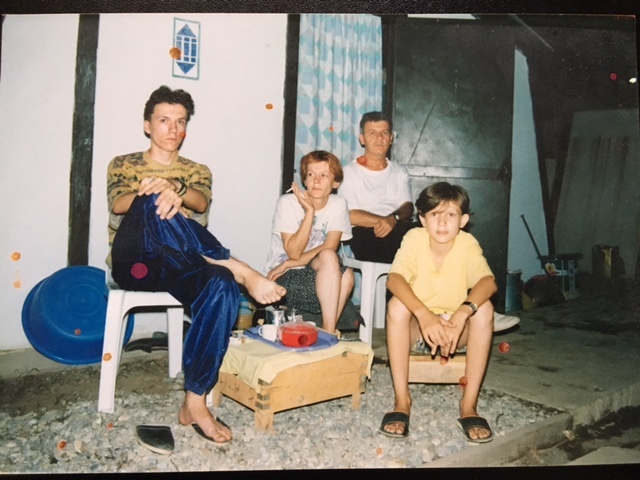 In the second one, it is 1994, two years after nationalism broke up Yugoslavia; my parents, my brother, and I were living in a dusty Turkish refugee camp a few hundred miles away from the Bulgarian border. We shared the bathroom and the shower-room with some 3000 other Bosnians who were similarly displaced by the war. We were all a part of the larger wave of human misery streaming out of the Balkans in the 1990s. We lived the Yugoslav dream on the beach. We also watched it die on the beach. Two years before the war ripped through our neighborhood, we took our summer vacation one last time. We swam in the Adriatic sea one last time. 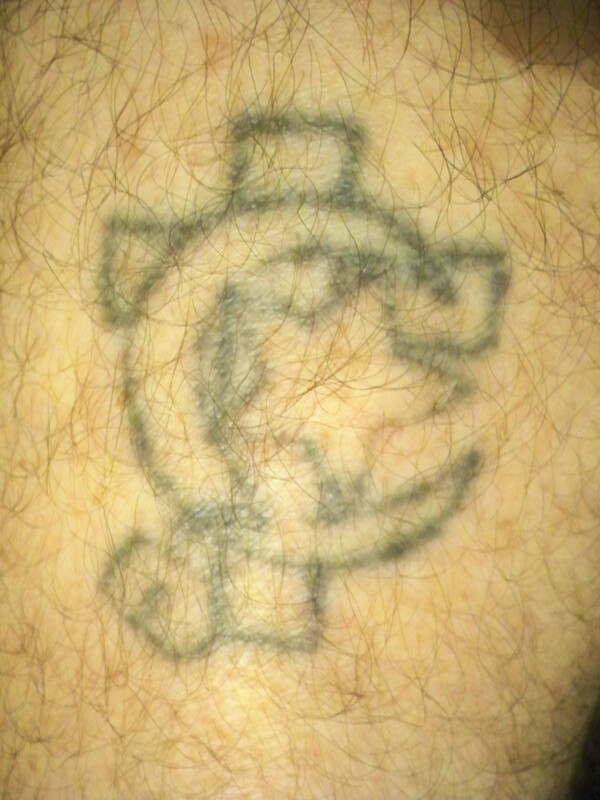 Everything seemed the same except for one thing: my father wore a bandaid to cover up the tattoo, above his left knee, which he had gotten while serving in the military a few decades before. I had seen the tattoo, but never paid close attention to it. It depicted a padlocked Christian cross and a Muslim crescent and star. The tattoo screamed peace between nations at a time when these were gearing up for war. My father’s fear was well-founded, for the country in whose sea we were swimming at the time would soon no longer be Yugoslavia, but Croatia, and the tattoo could be read as an anachronistic symbol of a regime dying a violent death all around us. During the war, the tattoo became even more of an ominous scarlet letter on my dad’s leg because it signified that he was living in a mixed marriage: a Muslim man married to a Croat woman at a time when Muslims and Croats fought each other viciously for the right to live separately, each group in its own mini nation-state, only a few kilometers apart. It wouldn’t be long before my father would have to hide in our TV stand to escape the Croat militias who were ethnically cleansing our neighborhood of all Muslims, or worse; before my mother had to lie about her name to pass herself off as a Muslim in the overwhelmingly Muslim refugee camp in Turkey. Or I would become a devout Muslim, almost ending up in an Islamic school, before lapsing from Islam and becoming a secular American. My young life, I was able to rebuild from scratch. My parents, already in their late 40s when they came to the US, were out of time. They’d spend the next twenty years in America working twelve-hour shifts in a factory. The point of my navel gazing is that Trump’s style of nationalism is all too frequent and familiar, and occasionally viciously destructive. He uses it because it works. And it works because it invites ordinary people onto the stage of history, shines a spotlight on them, and makes them feel important. The nationalism of the French Revolution transformed the hungry and ignored lower working classes of Paris into the foot-soldiers of the history-making Jacobin movement. The nationalisms of the nineteenth century revolutions against the Ottoman and Austro-Hungarian empires gave the disenfranchised middle classes an aura of respectability in addition to opportunities at better careers. The blackshirts and the brownshirts of Mussolini and Hitler, respectively, marched, beat people up, volunteered, and fought, because they felt they were ushering the world into the end of history. The Croats, the Serbs, the Muslims, the Macedonians, the Montenegrins, the Albanians, and other nations of the former Yugoslavia rallied to their respective nationalist leaders in the 1990s in order to live history: they voted, organized, protested, and eventually fought for the nation-states they felt promised to them by history. Similarly, Trump supporters have come out in droves to vote for him, volunteer, attend his rallies, and ocasionally, strike out in violence, because in the words of Trump they hear their own anxieties, long repressed thoughts, and anger, and no longer feel ignored. Nationalism need not be violent, and can even be positive. In the aftermath of the French Revolution and the decline of the divine right monarchies, European elites, desperate for new forms of legitimacy, flocked to nationalisms. They rebuilt cities, instituted first health care, pension, and unemployment funds, created public transport systems, and introduced free public education. This is because at its core, nationalism is a community-building program. But because it is also community preserving, nationalism has a tendency to lash out against the enemies—most often perceived rather than real—when it feels existentially threatened. And this is exactly the moment Trump is tapping into. Demographically, economically, and culturally, the lower white working classes feel themselves besieged: the jobs their fathers had taken for granted are gone, there is a black man in the White House with a funny name and a complicated background, and you can no longer say sexist and racist jokes without being scolded. Trump gives voice to these concerns, lumping them all under his promise to wage war against “political correctness,” and he erects rhetorical walls around his followers to protect their identities from further erosion. I do not mean to suggest that we are on the precipice of a civil war like the one that destroyed Yugoslavia. As a historian I would not dare make such a prediction because social scientists have an abysmal record in prophecy. Karl Marx, the social scientist par excellence, predicted a wave of revolutions in 1848, but the ones that swept the continent that year were not the ones he had predicted because leftists of all stripes were crushed by reactionary conservatism. In 1989, the respected political scientist Francis Fukuyama boasted that the victory of the West in the Cold War meant a perpetual worldwide reign of Western liberalism just years before Al Qaeda launched its war against the West and decades before a new wave of authoritarianisms swept across Europe. In 1990, the brilliant historian Eric Hobsbawm declared a declining relevance of nationalism just a year before nationalism destroyed Yugoslavia. My aim is more modest. It is a warning that the stories Trump tells, or shouts, and the walls he erects, are embedded in an ideology that has a proven record of destroying countries. And lives. Fedja Buric is an assistant professor of history at Bellarmine University (the views in this piece are his own and do not represent the university).